Al, Dunkin, Kenly, Midnight, Bree, Dakota, Gabby and Luci lived their first 4 1/2-5 weeks in the woods. Their mom is a stray that is still “at large”. We have not been successful in catching or trapping mom. 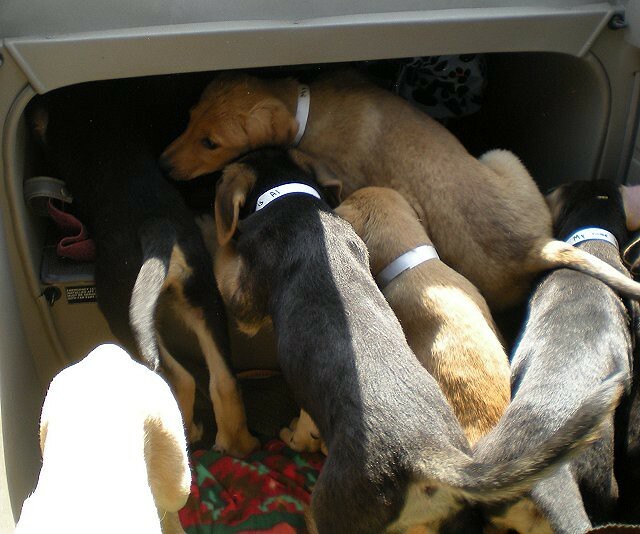 Amazingly the pups had not become so feral that they were hard to catch. 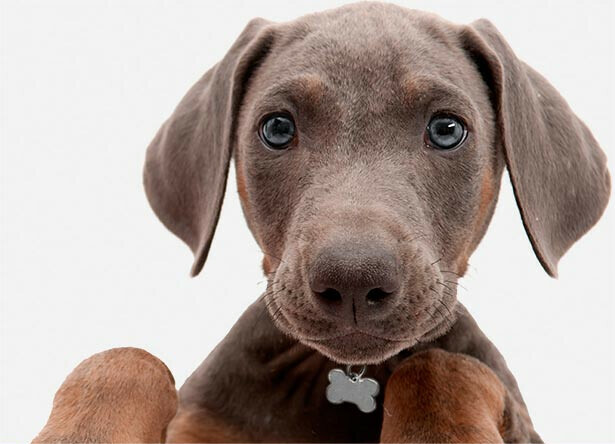 They spent their first few nights hiding out in a puppy day care before they were taken in by an independent rescuer that works with a group out of Wappingers Falls, NY called, “Crate Escape”. 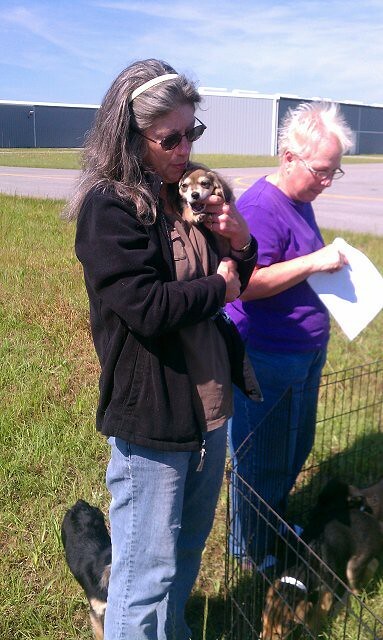 Crate Escape agreed to take all 8 pups plus Dodge, Tinkerbell and her two younger siblings, Teddy and Dolly. Dodge was found by a Good Samaritan walking next to a very busy highway. They were on their way to a car dealership to look at a Dodge truck when they spotted him. After some coaxing, they were able to catch him without him getting hit by oncoming traffic. Tinkerbell’s original family had given her up to a man that later decided that having a dog constricted his freedom. 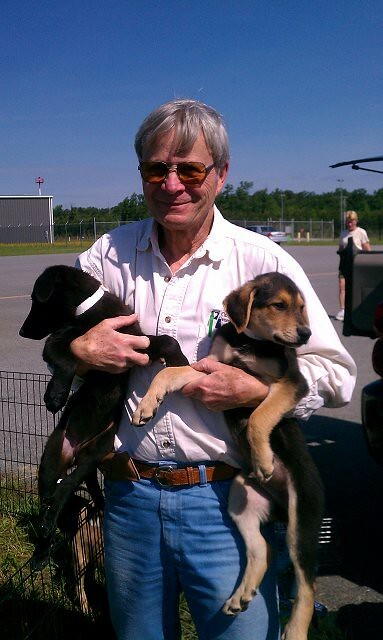 He was also fostering Teddy and Dolly for Crate Escape and asked if they would also take Tinkerbell. All 3 had the same mom but Tinkerbell is about a year older. Their mother was hit and killed by a car before Teddy and Dolly was weaned. Tinkerbell became their surrogate mom. Thankfully, all 12 of these will now be able to find their forever home in NY with the help of Crate Escape and pilots Michele and Elliott. 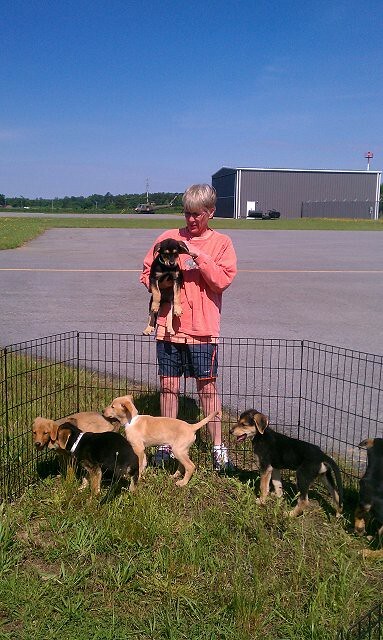 Team Mutt Muffs decided to celebrate Memorial Day by helping 12 little innocent puppies start happy new lives. If this beauty didn't have such good prospects, she would be going home with me. This is Pam. Angel extraordinaire. She works with local kill shelters to remove as many souls as possible. With limited resources, she manages to care, feed, and arrange medical treatment for so many animals, and then she sends them on their way where they can find families to call their own. Without her, they stand no chance at all. 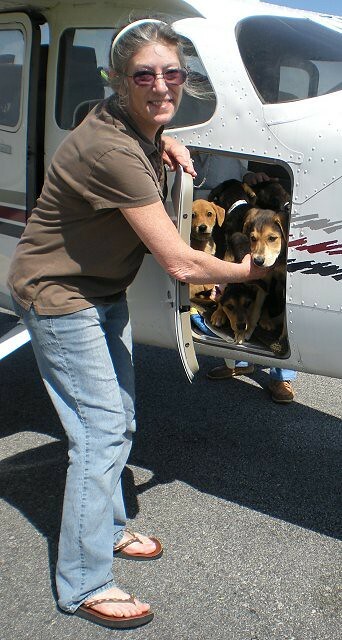 We finally took the back seat out of the plane to allow more space for the furry passengers. Even with the additional payload, it took some serious logistics to accommodate everyone. And then eight of the lovelies decided to conduct a weight and balance experiment by crawling all the way aft in the tail cone. 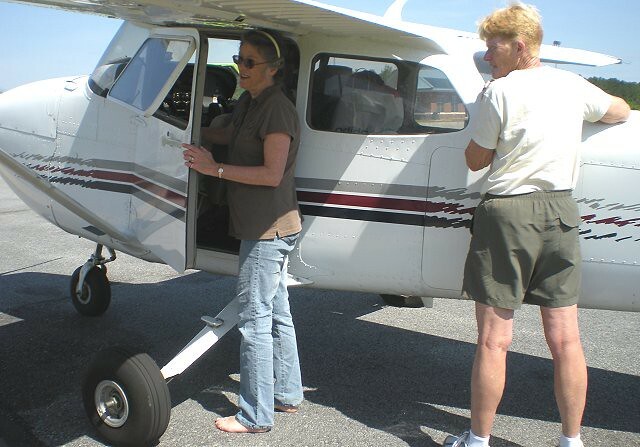 Air Mutt Muffs pilot Michele and rescue volunteer Vicky finally have all our passengers settled in. It was a beautiful flight through the Virginia countryside, and right up the Chesapeake Bay. Leg 2 Pilot Elliott was waiting for us at KDMW, Westminster, MD. We have great folks working there. Two linemen drove out on the fuel truck to help us with all the puppies. Eventually, we get everyone transferred to Elliott's plane, and he started the second and final leg of the journey. 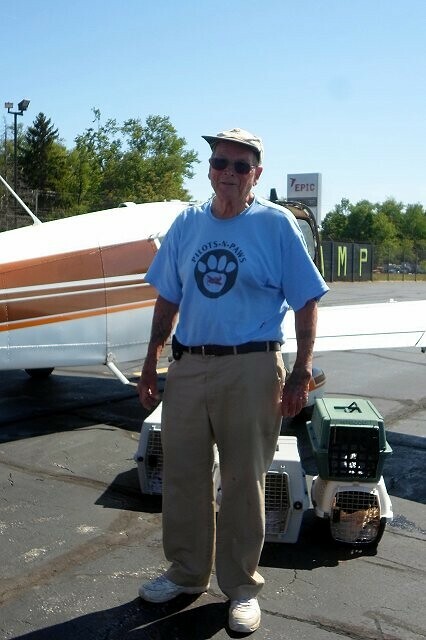 Elliott got the honor of delivering all the fur balls to waiting families and fosters. Little Dakota and Dunkin meet their new foster "sister" Kim. 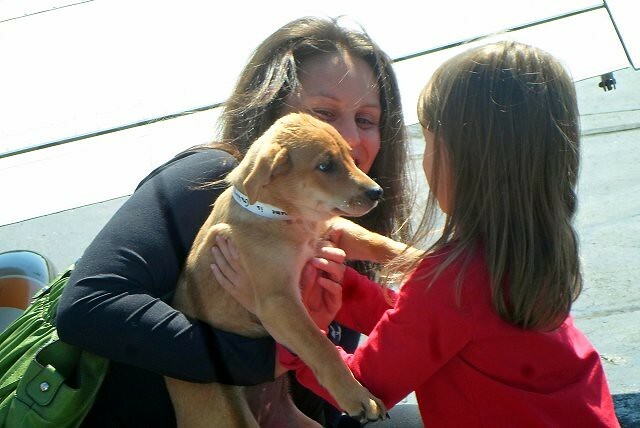 It will only be a short stay though, because they have a forever family waiting for them already in Connecticut. Dodge says Thank You to rescue volunteer Jordan. I bet he's also inquiring about the big plane, wondering if he has to take another ride. What a lucky dog. Found wandering alone on a busy highway in NC, he now has a loving family to call his own. 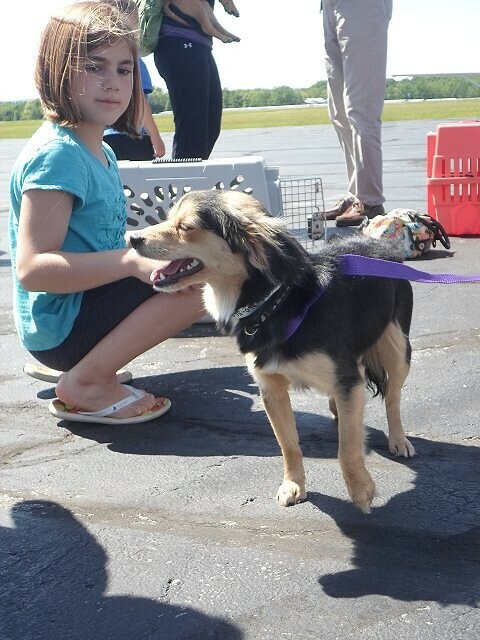 Little Miss Tinkerbelle also will have a very short stay with this foster family. She has a new family waiting to adopt her. One more short trip to Long Island, NY and Tinkerbelle will finally be home. 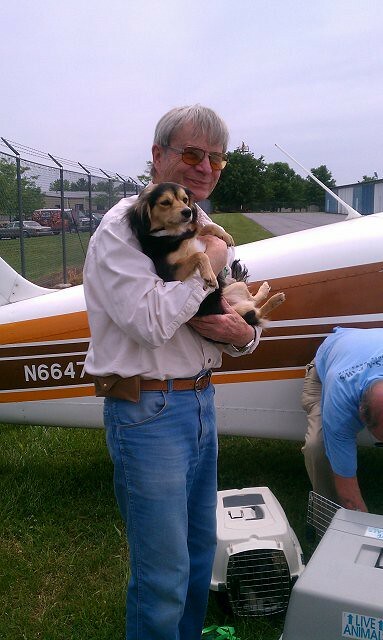 Gabby disem"barked" the plane straight into the loving arms of her new foster family. I know she has a bright future ahead of her. Many, many thanks to all the rescue volunteers who make this all possible. Thanks to Pam, Vicky and Peggy in North Carolina. These ladies are on the front lines of a horrible overpopulation problem, and they work miracles. And many thanks to Heather and her army of volunteers at Crate Escape. It does no good to rescue dogs from a kill shelter, it there's no place for them to go. Heather sees to it that there is.